There are two main groups of bonsai trees: indoor and outdoor. Indoor bonsai trees tend to be tropical or subtropical species. Outdoor bonsai trees include two groups: evergreen trees and deciduous bonsai trees. Both deciduous bonsais and evergreen bonsais enter a dormancy period during the winter months. During this dormancy period neither type of bonsai can be indoors. They must be kept outside in cold weather in order to facilitate the dormancy period. Unlike Evergreens, which keep their leaves all year round, deciduous trees lose their leaves during the winter months. The term “deciduous” actually means, “falling off at maturity”. 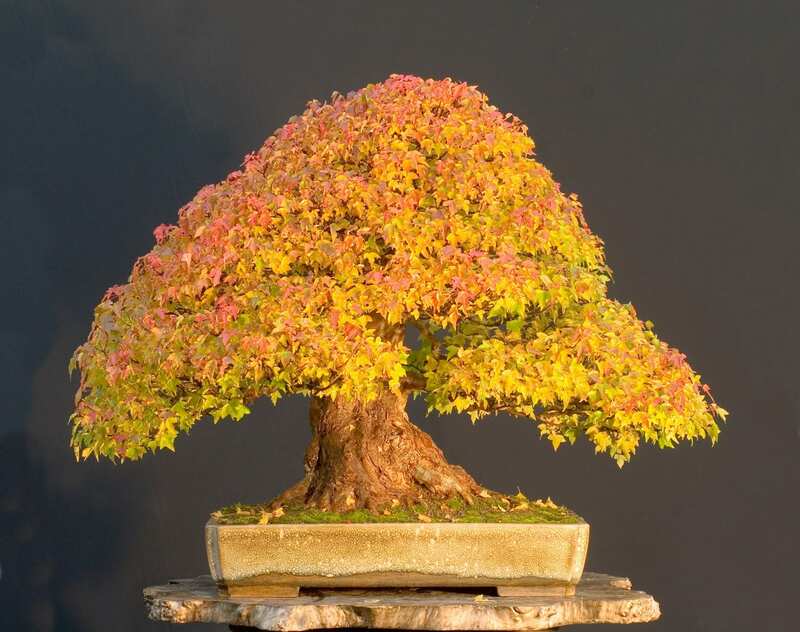 Four of the most popular deciduous bonsai trees include Elms, Maples, Ginkgos, and Apricot trees. Out of the many species of Elm used for Bonsai trees, the Chinese Elm is one of the most popular. At normal growth it can reach up to sixty feet high. If kept indoors it tends to keep most of its leaves. It only becomes deciduous when it is taken outside. This is a good bonsai for beginners because its growth pattern is predictable and it is very forgiving when it comes to pruning. Maple bonsais are also great for beginners. They tend to be sturdy and easy to care for, and on top of that the color changes of their leaves are beautiful, turning to vivid reds and golds throughout the seasons. There are many different species of Maple. The two most common Maples used for bonsais are the Japanese Maple and the Trident Maple. The Ginkgo tree is native to Japan where its fruit is most commonly thought to improve health and memory. The leaves are fan shaped and turn a stunning yellow in the fall season. Its lifespan can be as long as a hundred years and as a bonsai it can grow up to sixteen inches tall. The Apricot bonsai hails from China where it is grown and maintained for the beauty of its flowers as well as its fruit. Their life span tends to be about nine years and they can reach about seventeen inches high. The flowers begin to show near the end of winter while the fruits will begin to ripen in early summer. How Do You Care For A Deciduous Bonsai Tree? Caring and maintaining a bonsai tree is an art form. The proper care and maintenance of a bonsai tree can result in extraordinary beauty. The following are five steps necessary to the health and beauty of a bonsai tree. A deciduous bonsai tree should be placed outside during the spring, summer, and fall seasons in a place where it will receive plenty of sunlight. Locations such as the balcony, the garden, or on a patio are all suitable. The deciduous bonsai tree should not be indoors for more than a few days at a time. During the winter months the bonsai should be stored somewhere where it will not receive any sunlight and where the temperature is relatively cold. One option is to bury the bonsai outside in an area that doesn’t receive sunlight. The other option is to keep it somewhere dark and cold, like a garage. The important thing is that it is in a cold area without light during the winter months so that the bonsai can enter its dormancy period. The deciduous bonsai should be watered whenever the soil appears dry. The soil should always remain slightly moist. If the tree is in direct sunlight then it may be necessary to water almost every day. Water the bonsai using a hose attachment or a watering can and stop when the water begins to run out of the holes located in the bottom of the pot or tray. The act of watering the bonsai is very important as watering it too little will dry it up and watering it too much will drown it. It is a balancing act that has to be learned from monitoring your bonsai. When the bonsai is in its dormancy period it will still need to be watered at least once every two weeks. There is no need to fertilize the bonsai during the winter, but during the other three seasons fertilizer should be added once a month. There is very little soil in a small pot or tray containing a bonsai and it is a good idea to refresh the nutrients in that soil to keep the bonsai as healthy as possible. Deciduous bonsais should be re-potted every two to three years so that the tree receives fresh soil. It is recommended that this be done in the middle of summer. Trim and pinch the branches of the bonsai tree to keep it at a miniature size as well as to keep it aesthetically pleasing. There is an art to this that takes both research and practice. Taking care of your deciduous bonsai tree requires delicate care and attention. The meditative act of doing so, as well as watching your bonsai grow more beautiful over the years, is a truly rewarding one.